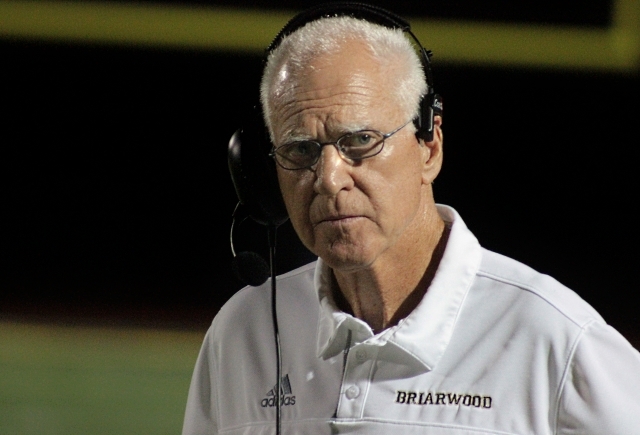 Birmingham, AL – Briarwood Christian head football coach Fred Yancey announced Monday that his 29th season at the helm of the Lions football program would be his last. The legendary coach delivered the news that he is stepping down during a team meeting at BCS. Yancey’s Briarwood quad spent the majority of his final season ranked as the top team in class 5A. The Lions finished 9-3, falling to the Vigor Wolves in the second round of the postseason. It’s the end of an era for Briarwood Lions football – a very successful era. The Memphis, TN native became the North Shelby County program’s sixth head coach in 1990 posting a 278-95 record including three state championships, three runner-up finishes 16 region titles, fifteen seasons with at least 10 wins, and a undefeated season in 1998. His Lion squads have advanced to the AHSAA postseason a total of 27 times including the past 26 years in a row with a playoff record of 59-24. A class act who won 3 state titles, he turned young players into men@WBRCnews was there when the coach made his announcement. With 278 wins on the gridiron, he currently ranks 11th in victories in Alabama high school football history. At the end of 2018 he ranked sixth in victories among active coaches. Before arriving at Briarwood almost three decades ago, Yancey spent time at as an assistant at Memphis’ Overton High School and had head coaching stints at Towering Oaks High (TN), Gatewood School (GA) and Evangelical Christian (TN). In addition to mentoring a number of players who went on to play at the collegiate and professional levels, several of Yancey’s former players have followed his footsteps and entered the coaching profession. Former Lions quarterbacks Joe Craddock (University of Arkansas offensive coordinator) and Barrett Trotter (Auburn University offensive analyst) are currently on Southeastern Conference coaching staffs. In addition to leading the Lions on the gridiron he also coached basketball, soccer and track during his coaching career. He has received multiple Shelby County Coach of the Year honors as well as being named the Alabama Sports Writers Association Coach of the Year in 1996 and 1998.